If you're planning on attending Sage Summit this year, register before March 31st to take advantage of this great customer promotion. Hurry! VIP registration ends soon. 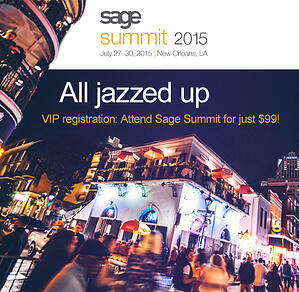 Let the good times roll: Registration for Sage Summit 2015 is now open! Register today to reserve your spot at the most valuable gathering for small and midsized businesses. New for 2015: You-based training! It's simpler than ever to find and register for Sage Summit training. While you register, the website creates training suggestions based on your profile and your business needs. Be sure to review and select the training you want to add to your agenda. It will make planning your personal event experience quick and easy. If you need additional information, or assistance on how to make the most of your time at Sage Summit 2015, feel free to contact us.